Gold Mining Shares Hated & Forgotten - Value Opportunity? I like to buy assets when they are little discussed, forgotten, or best of all; hated. I spent very little time here focused on purchasing precious metals between late 2009 through late 2011. I talked a lot about holding current positions and the long term potential of the asset class. The reason why is because sentiment toward precious metals was rising, the metals were being discussed in the media, and they were generally liked. It was like the small town band that only you listened to all the sudden being on the radio. An incredible rise in silver from late 2010 to the spring of 2011 gave the metal a 170% rocket launch in just a few short months. Silver then peaked and subsequently collapsed in price back to to the low $30 range where it has been moving sideways since. This move appeared cataclysmic to new participants in the market, but it was just standard procedure in terms of percentage moves that I have come to get used to since buying my first ounce at $7 in late 2005. As a quick refresher on some of the violent movements since late 2005, prices ran up to $15 before collapsing back down to $9. After trending sideways for a few years prices rose up to $22 before collapsing back down to $8. Then they trended sideways for a few years before the late 2010 rocket launch. The "trending sideways" period is the time I like to purchase, specifically when there are large downdrafts in the price and sentiment levels reach rock bottom. This occurred in late 2011, late May/early June in 2012, and it is occurring again right now. After sitting out the market close to two years, I have been very active over the past 13 months. 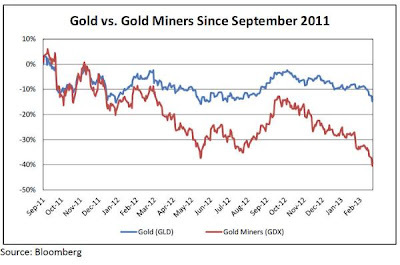 I find the same value dynamic and extreme pessimism, only even more so, in the gold mining sector today. Gold and gold mining shares, since the bull market began in 2000, have taken turns in terms of out-performance Gold will out-perform the mining sector for a period of time, and then mining shares will "catch up" during which the value gap has been filled. This process is now in its thirteenth year running, which is why I find it fascinating that the best mining analysts today say that the mining sector is more undervalued relative to the price of physical gold than at any point in history - including the bear market bottom for gold in 1999 when the thought of owning a mining stock was truly laughable. The following chart shows this back and forth process providing the ratio of a gold mining index relative to the price of gold. You can see the extreme undervaluation of the gold mining shares relative to gold heading into the year 2000. Then during the early 2000's they "caught up" and significantly outperformed. In late 2004 through early 2005 they lagged, then "caught up" again to fill the value gap. They fell far more during the financial crisis sell off creating a value opportunity during the peak of panic. Coming out of the crisis they outperformed gold significantly. The point here is to show you the process of taking turns as one moves out of favor while the other moves ahead, then vice-versa. The next chart picks up where this one leaves off and takes you from September 2011 through present day. While gold has tracked sideways, the gold mining sector continues to sell off, bringing the record divergence in value. The mining sector has already priced in a complete collapse in the price of gold. Should a price collapse come maybe they will move lower. But what if the gold price were to just stabilize around $1600 and not move up from here? The value gap would eventually be filled. Most readers know that I believe that while gold certainly has the potential to move far lower in the short term (why I always recommend an ample supply of liquid cash), I believe it will be far higher than $1600 before the conclusion of the current bull market. The following letter comes from John Goltermann at Obermeyer Asset Management and provides his thoughts on this topic: the current gold vs. gold mining share value gap. Click on the bottom right box to bring it full screen.